The Rapid Box is constructed from solid aluminum to minimize weight, yet retain durability. This modifier opens and closes like an umbrella. No support rods or adapter ring needed. Everything is compact and easy to use. 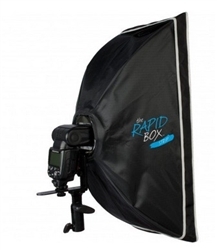 With a shallow depth, the Rapid Box works in virtually any lighting situation. No matter which box you choose. The Rapid Box series is always compact. An optional, screw-in deflector plate is available to minimize hot spots and create a beauty dish light output. The front diffusion material is the same quality as found on Westcott's current high-quality soft boxes. The height and depth are adjustable and compatible with virtually all shoe-mounted flashes. Durable carry case with shoulder strap is also included for simple transportation and storage. External speedlight placement allows firing via built-in slaves and/or IR line-of-site.